Dominique Cheng’s illustration work stems from an incurable obsession with the world of cartography and aviation that began in 2007 with a project entitled “Planespotting”–a speculative project about the landing approach into the former Hong Kong International Airport. 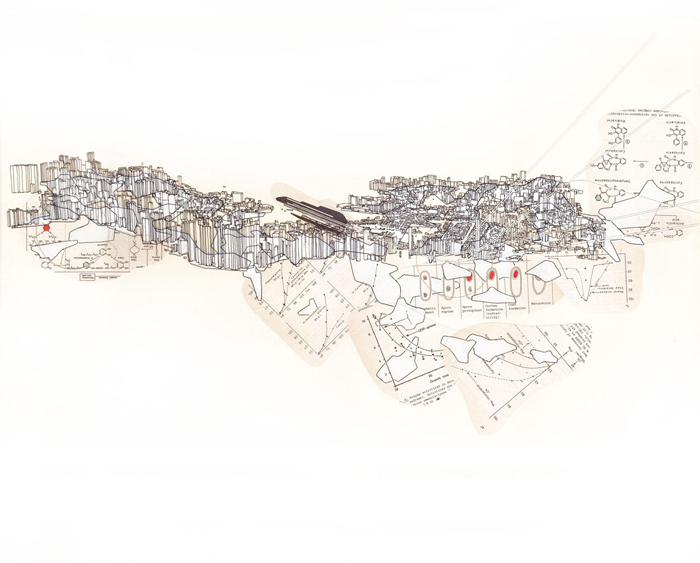 The “1331” Series, which began in 2013, belongs to a larger study of deconstructive cartography; more specifically, it refers to the purposeful reduction of a map to one of its aspects, through the erasure of known information and bricolage. The series was created to trace the inextricable relationship between the growth of a city and its airport. The resultant “map” is stripped of any reference to a specific geographical location–no text or borders are indicated. 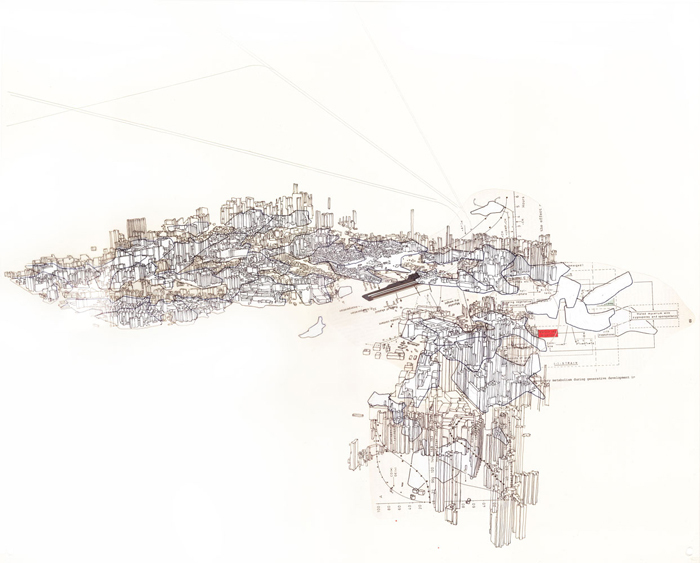 Instead, the architecture of the city is represented as a dense network of signs and shapes that are tentatively held together by a unifying stroke–the flight path. 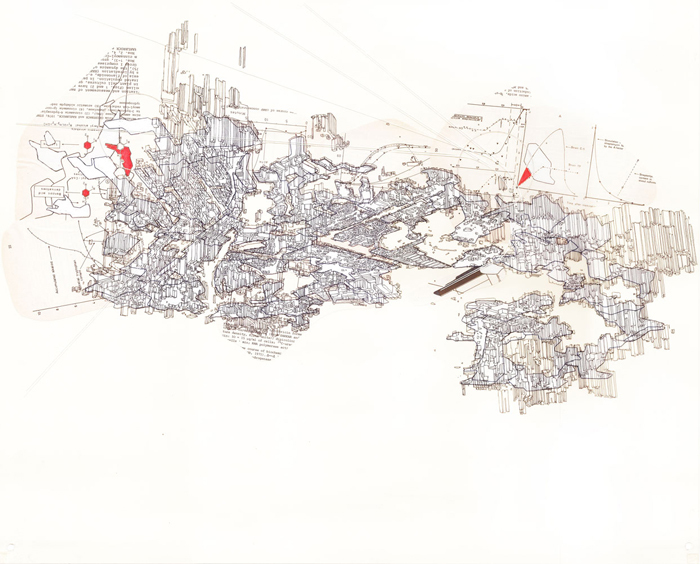 The physical drawings themselves are multilayered in composition, comprising transparent Dura-lar sheets on which the line work is imprinted and clippings of printed media superimposed. Each formal layer could be seen to signify a specific point of view or perspective of the city. Dominique Cheng (b. 1979) is an architect (by training) and illustrator/installation artist (by choice). Recently, his work has been featured in The Site Magazine, Warehouse Journal (University of Manitoba), Testing Ground Journal (University of Greenwich), and Drawing Futures (Bartlett University). He is the recipient of the OAA Architectural Concept Award (2016) and was a Finalist for the prestigious Arte Laguna Prize in Venice (2016).